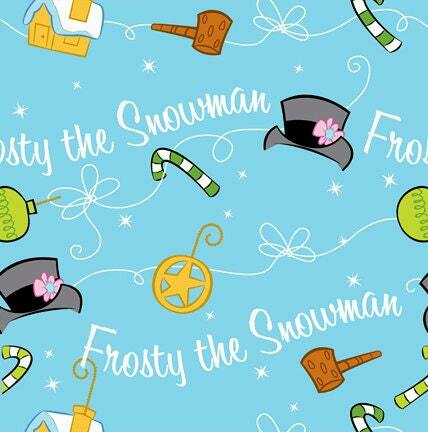 SNOWMAN FABRIC- FROSTY THE SNOWMAN SILLY SNOWMAN HOLIDAY FABRIC COMING SOON! Frosty The Snowman Silly Snowman holiday fabric is scheduled to arrive at The Quilted Nursery Fabric Store the first week of November. Such a timeless holiday character, a perfect fabric for all ages. Create pillow cases, table toppers, quilts, holiday decorations and so much more. Team up this fun fabric with the Silly Snowman Diagonal Stripes fabric and you are set for the evening. Order your fabric today and your order will ship the same day we receive our shipment. All fabric from The Quilted Nursery Fabric Store is cut directly from the bolt. We now offer fractional yardage including fat quarters. Don't delay, and get a head start on your holiday sewing! Repeat buyer to a wonderful store with an amazing owner with great fabrics with great prices! I love how the fabric feels and this fabric is very fun to work with!